Last October, 25 intrepid souls from across the country converged on Billings for a fun and memorable adventure. Thankfully, the weather was perfect, allowing us to drive over some dirt roads (at Deer Medicine Rocks, and in the vicinity of the Crow's Nest), and to enjoy some beautiful hikes at the Rosebud and Little Bighorn battlefields. The shocking news of Little Bighorn erased the memories of the Rosebud from all but a few actual battle participants. Yet, it is second only to the Little Bighorn in terms of total number of troops and Indians deployed in battle. Geographically, the Rosebud Battlefield is larger than Custer Battlefield. Equally significant is the style of fighting exhibited by the Indians. It marked a departure from their customary sporadic hit-and-run tactics. Instead, the Sioux and Cheyenne unified in a common cause, concentrated their forces in large numbers, and fought "with unprecedented group impetuosity." October 16: arrive at the Boothill Inn and Suites. 6:30 p.m: gather in the hotel lobby (breakfast area) for your registration packet (map booklet, nametag, and sundry items), meet your host and guide (David Woodbury, and Neil Mangum), and enjoy a private reception in the hotel's dining area (pizza and beverages are included in your registration). 7:30 p.m: hear an overview by Neil Mangum, setting the stage for our days of bus and walking tours. Board the bus each morning at 8:00 a.m. in front of the hotel, for an 8:15 departure. We'll return each afternoon by about 5:00 p.m. (but likely after 6:00 p.m. on the 18th). Water and snacks on the bus, plus lunch, will be provided all four days. October 18: The first order of business, and most of the day, will be devoted to an exploration of the Rosebud Battlefield(6) (including a 4-mile round trip walk to Crook’s Hill). We'll picnic at the Rosebud Battlefield State Park. Before returning to the hotel, we'll visit the August 1872 Baker Battlefield,(7) arriving at approximately 5:00 p.m. There, we'll hear a presentation by local historian Dave Eckroth, who with his partner Harold Hagen has done phenomenal work documenting this clash. October 19: This day is devoted to the Reno Valley fight, Skirmish line and Reno's Retreat across the river to the bluffs. We'll drive up Reno Creek as near as possible to the Crow's Nest (the vista point from which Custer's scouts first spotted the horse herd of the distant village). We'll visit the morass, pausing near the Lone Tipi(8) site and the site of Reno's crossing of the Little Bighorn, drive through the location of the Indian village; and visit Custer Battlefield Museum and bookstore/giftshop. Lunch will be at the Bury the Hatchet BBQ in Garryowen. For the balance of the afternoon, we'll walk around the Reno-Benteen defense site and visit Weir Point inside the Little Bighorn National Monument. 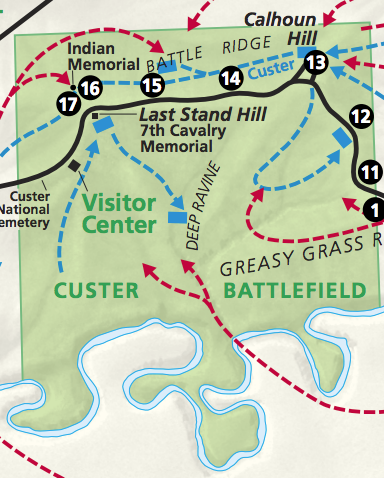 Bonus Battlefield: we’ll finish the day with a stop at the Canyon Creek Battlefield(9), on the outskirts of Billings, before returning to our hotel. Depending on our timing, our Canyon Creek stop may get moved to another time slot. October 20: the full day will be devoted to the movement of Custer’s battalion, with stops at principal sites on the battlefield, including a walk to the Keogh sector. Tour exclusive includes venturing off NPS property onto the surrounding Crow Reservation with a walk up Nye-Cartwright Ridge and down to the banks of the Little Bighorn River. Lunch will be at the Custer Trading Post cafe, renowned for their Indian Taco (you'll have time to browse the Trading Post bookstore and gift shop as well). Our long journey concludes atop Last Stand Hill. We'll make a final stop at the Visitor Center Museum & Bookstore, and return to Billings in the late afternoon. Neil Mangum is one of the nation’s preeminent authorities on the Indian Wars, and a much sought-after guide for historical tours. His long career with the National Park Service included stints as historian, and later, superintendent at Little Bighorn Battlefield National Monument during periods of important change—working with the tribes to build the Indian Memorial, and overseeing the erection of the first Native American markers on the battlefield. He has published many articles and papers on Indian Wars subjects, and is author of The Battle of the Rosebud: Prelude to the Little Big Horn. Custer's last message, written by Custer's Adjutant Lt. W.W. Cooke on a sheet torn from his field dispatch book. At the top and right of the message is a "translation" written by Captain Benteen. The original message is in the U. S. Military Academy Library, West Point, N.Y.
Credit: Courtesy of the National Park Service, Little Bighorn Battlefield National Monument. 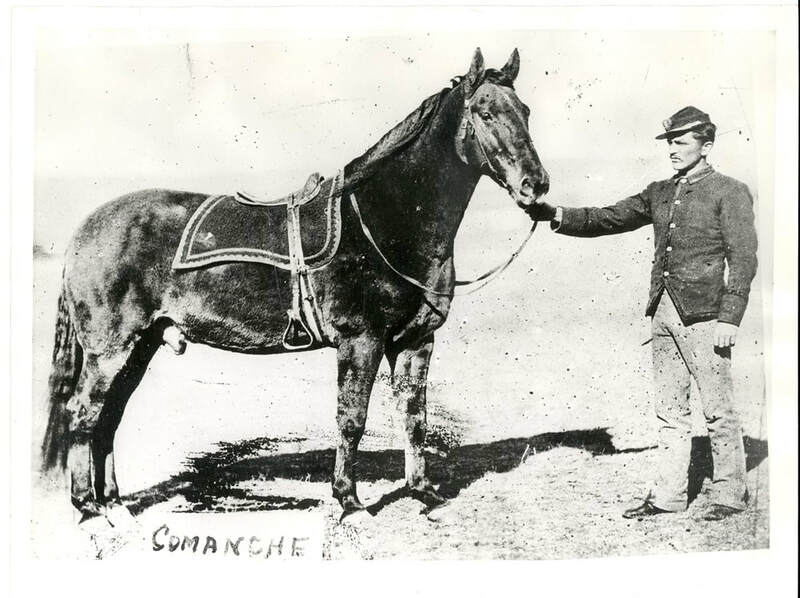 LIBI_00011_07119, Photographed by Unknown Photographer, [Possibly F.J. Haynes], "Comanche: The Horse that Survived the Little Bighorn," circa 1880. (1) From the NPS: Deer Medicine Rocks is significant for its associations with the Great Sioux War of 1876-1877. In early June 1876, Hunkpapa medicine man Sitting Bull held a Sun Dance in the Rosebud Valley during which a prophecy of tribal victory at the Battle of the Little Bighorn was revealed to him. This vision is inscribed on Deer Medicine Rocks, which includes an etched drawing of “many soldiers falling into camp,” representing army defeat. Approximately two weeks later, the tribes were victorious over Lieutenant Colonel George A. Custer’s Seventh Cavalry Command at the Battle of the Little Bighorn on June 25-26, 1876. This is private property, and is accessed only by permission. (2) Read this brief biography of Cheyenne Chief Dull Knife from the Encyclopedia Britannica. (3) Read this brief biography of Northern Cheyenne Chief Little Wolf from the AIRC. (5) Cheyenne Cheif Two Moon fought in both the Battle of the Rosebud, and at the Little Bighorn, and survived to fight other battles. His last fight was at Wolf Mountain, where he ultimately surrendered to General Miles, in April 1877. (6) Read and excellent, and brief summary of the Battle of the Rosebud at this Montana States Park page. (7) Troops under Major Eugene Baker (four companies of the 2nd Cavalry and four of the 7th Infantry), escorting a railroad survey crew for the Northern Pacific Railroad, battled a large force of Sioux under Sitting Bull on August 14, 1872. We’ve made arrangements to access this private battlefield, where we’ll meet up with historian Dave Eckroth, who is writing a book on the 1872 Yellowstone Expedition. Dave will interpret the site for us during our stopover. Read an article on the Baker Fight at the Billings Gazette. (9) While the Canyon Creek Battlefield is unrelated to the main themes of our tour, its close proximity to our hotel makes it irresistible to include on our first day's outing. Canyon Creek is the location of the second-to-last battle of the Nez Perce Flight of 1877. After emerging from Yellowstone National Park, the Nez Perce were pursued by the Seventh U.S. Cavalry under Samuel Sturgis. 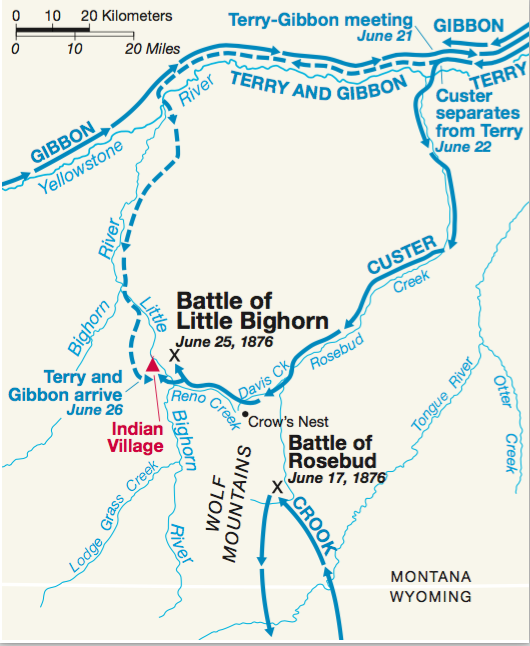 In a rearguard action, the Nez Perce were able to gain time by successfully stopping the pursuing troops at Canyon Creek on September 13th. This will serve as a prelude to a future tour strictly devoted to the Flight of the Nez Perce.